5793 labyrinths found. Showing 4361-4380. Sorted by country, state, city, then zip/postal code. 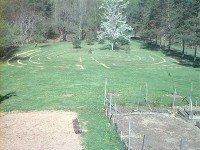 We have 2 labyrinths at the center. It's best to follow the directions on our website, because some GPS systems take you on a longer, seasonal road. N 42.12° Lat. ; 76.33° Long. Cretan design enhanced to ten circuits. Woodland setting with dwarf bamboo walls, ivy and clover path. 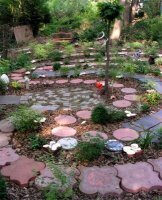 Labyrinth available during COSM scheduled events and by appointment. Spiral ankh pattern created with Himalayan stick method. 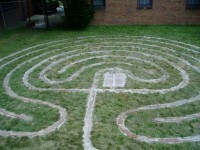 The labyrinth is located at the far end of the parking lot behind the church. You can also access the labyrinth from Fifth Street. 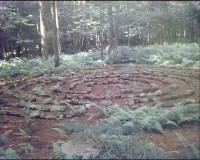 Seven circut labyrinth that is located 4.4 miles from the center of Wellsville, NY. 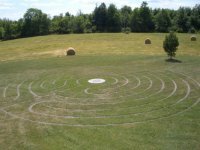 The labyrinth sits on top of a hill, facing south, with a beautiful 5 mile view in all directions. There is also a Celtic Cross and a Standing Stone that occupies the hill-top. State Route 81, exit at Central Square, turn right on Rt 49, pass golf course on left, turn left on County Route 11, left curve at cemetery, immediate right on County Route 26E, left at stop County Route 26N, first right County Route 23B, 1/4 mile on left #306. 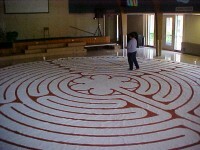 The Labyrinth is located inside Energy Shift Yoga studio which is inside Salone Gino building. 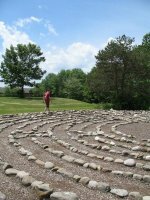 Come any Saturday and walk the labyrinth during our open house at 3pm otherwise come during the day or evening when we are not holding yoga classes and walk the labyrinth. You can call 631-636-0564 to set up a time. The Crystal Labyrinth is located in the back of the Crystal Connection Center, i.e the yellow church. This Labyrinth aims people awareness and Consciousness. Crystal Labyrinth is made of Crystals and Stones collected and donated by the community. It has Rose Quartz and other high vibration stones. 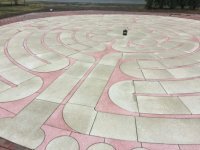 The labyrinth is at Charlie's Place, 1421 Malasia Rd (former Scout buildings), on the front lawn between the buildings on NW corner of Goodyear Blvd. & Malasia Rd. Anna Dusseau who headed up our paint team walks the labyrinth. There are little footprints at places on the labyrinth where her toddler daughter Lilly got into the paint and walked on the canvas. We are next to Resnik CLC on the west side of Akron, next to the park with the Native American Indian statue. Route 18/Market Street. Exit I-77 at exit #132 White Pond & Mull Avenue. Follow the White Pond split at the exit; turn right at the light. Then turn right on Frank Ave and follow until it deadends at West Market. Turn left. The church building is 2-3 blocks on the right. Located on Coleman Commons in front of the University Student Union off of Caroll St.